Look for the box on the left side of our HOME or product pages; it says “Click Here for Easy and Secure Online Ordering", or you can just click here: ORDER NOW! 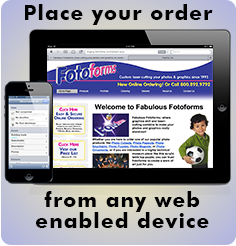 Our easy to use system allows you to fully complete your order, upload your image and securely pay with any credit card. My photo appears sideways in your ordering screen, is that a problem? A small percentage of photos turn sideways in the ordering upload screen. Please be sure we'll turn it right-side up when printing for your Fotoform. While we're at it, we will crop your image to make it as large as possible within the size you select and we'll do lots of Photoshop enhancements to make your image look the best it can. There’s a price list link on the left column of the home and product pages, or you can Click Here for our pricelist. Orders for standard items (anything you can order on our website) are generally processed and ready for shipment in 2-8 working days. Add 1-5 working days more for delivery. Yes, we’re happy to accommodate rush orders. Our rush charge is 25% (Minimum $8) of the total items for 2-day in-house production. We can also estimate the cost of expedited shipping if needed. Just give us a call at 800-892-9792 for more information. How should I prepare my images? Actually, the less you do the better. Just send the unaltered file and let us do all the work to make it the best it can be. What size (resolution) files are best? It’s difficult to know, just based on file size, how the print will turn out. In general it’s good if the file is at least 200Kb for products up to 5x7 in size, at least 750Kb for 8x10 and larger, and 2 Megs plus for larger items. That being said, we’ve made many items with lower quality images and customers are generally still very happy. Unless your file is very large, please don’t reduce the size. It’s fine if you send us a 10 Meg file for a keychain (we’ll reduce it). If you don’t know the resolution of your photo, don’t worry. Just send the order and we’ll let you know if there is a concern. We’ll refund your purchase before proceeding if the image is too poor. I have an old photo that’s not digital. Can I still order? Yes, you can either scan the photo and use the scan (be sure to set your scanner for 360dpi), or you can mail the photo to us and we’ll scan the original and make a copy to use in your product. You will get your original back along with the product you ordered. For information on our mail-order form, please call 800.892.9792 or 612.866.2282. What if my photo has something or someone I don’t want in the product? When you place your order there is a space where you can enter notes and special instructions for each product ordered. Do you charge extra if the photo has lots of people or complicated interior cuts? We charge according to the product size, not the complexity. I need lots of the same item; Is there a discount? Yes; please call us if you need more than 10 of the exact same item. Our laser makes repetition easy and we pass the savings along to you. Do you make all the products? Yes, everything we offer is made by us in our facility. 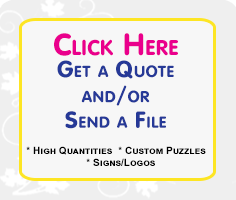 Why are your Photo Cutouts, Photo Popouts, Photo Puzzles ect, so much nicer than what other companies offer, yet cost about the same or less? OK, you may not have asked this question, but we do honestly think we provide the very best photo items available. Take a look at OUR PROCESS page for reasons why Fotoforms are better. I have a question that’s not listed here. What do I do? You can call us at 800-892-9792 where you’ll talk to a real person, not some automated system, who will be happy to discuss your order and make sure it turns out great.